Don't you just adore this fresh citron chandelier? These delicate lemon slices in handblown glass are simply lovely, I'd really like to place a few of these over a work table in the kitchen or in a trendy cafe over a bar. 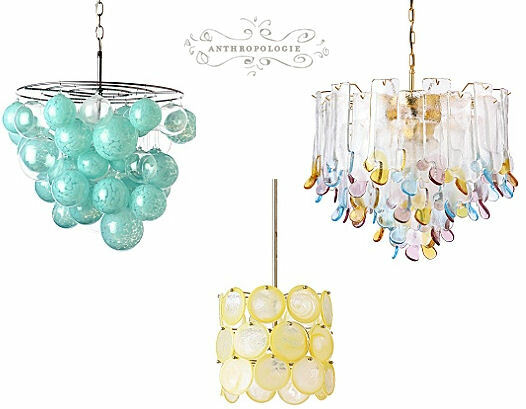 Problem is with nearly all of Anthropologie's lighting, it's soooo super expensive. Most of my clients would never throw down $3,000.00 for a light fixture, neither would I for that matter -- for two reasons. For one, I get tired of material goods quite quickly, always looking to upgrade or replace with a new style. It's not a good trait, I know. And reason numero deux, I'm a renter and certainly not able to replace current fixtures even if I did fall into a truckload of cash. It's still lovely to peek at these designs, despite how unattainable they are for most of us, and perhaps scout for something similiar that is more in our price range. I still love Anthropologie though. Sigh. Urbanware (UK) - 15% Discount!